Back in 2011, I took my first solo trip overseas; a full time Spanish course in the south of Spain. Each day, the lessons would have a different underlying theme, and the class would use that theme to try and explain (in Spanish) various aspects of our life back home. It started with the weather, and the Swiss girl in class talked about the snow, the Swedish girls talked about the grey skies and I talked about the hot Auckland summers and rainy Auckland winters. Then came sports, and the Swiss girl talked about skiiing, the Russian girl talked about boxing and I of course talked about New Zealand’s obsession with rugby. Then one day we finally had a lesson about food. The Swiss girl talked about Switzerland’s cheesy raclette, the German girl talked about Germany’s love for sausages, and I……had absolutely no idea what to talk about. What do people eat in New Zealand? I had no immediate answer, and spent much of the lesson struggling to come up with something that I could share as my country’s national dish. In the end, I just said we drink a lot of milk (lol). But it left me wondering; what is New Zealand food? What are our most beloved culinary inventions? And what, if anything, would be considered our national dish? However, over the last few months I think I’ve finally come up with an answer. I’ve been tripping around the country, exploring some of my country’s iconic foods and indulging in a few old childhood favourites. New Zealand cuisine is simple, but it’s also comforting, delicious, and loved. The list I’ve compiled below is a collection of those special NZ foods; things that all Kiwis seem to know and love, and things that have unarguably cemented their place in Kiwiana food history. What food is New Zealand known for? Let me show you! Cookie Time’s “Original Chocolate Chunk Cookie” is a timeless Kiwi favourite and the recipe has remained unchanged from when I had my first one over 20 years ago. As kids we always used to break our cookies open and see who could find the biggest chunk of chocolate – and seriously, you can find some massive ones in these things. Another popular thing to do is nuke it in the microwave for about 10 seconds, giving you a softer, chewier cookie oozing with warm melted chocolate. Delicious. Get it at: Any NZ supermarket, service station or dairy (convenience store). There’s also a Cookie Time cafe you can visit. Lamingtons are a sponge cake, coated in rasberry or chocolate and then sprinkled with shaved coconut. It’s common to cut them in half and fill them with cream or jam, but in most cases it’s simply eaten as is. A very popular snack enjoyed during morning or afternoon tea. Get it at: Any supermarket or bakery. I still remember back when I was in primary (elementary) school, we would all arrive on Friday mornings with our precious $1 coins clasped between our palms. 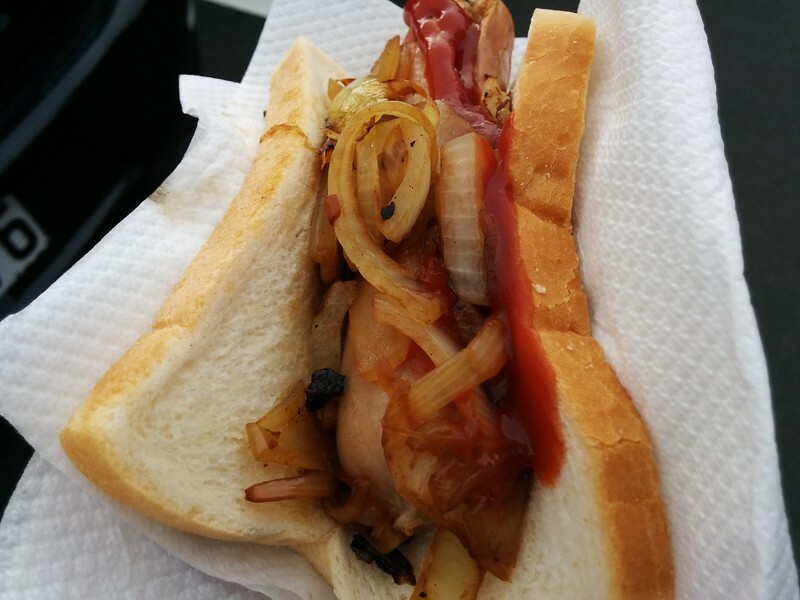 This, of course, was for Sausage Sizzle Friday, a weekly lunch event where the school would fundraise by selling stumpy pork sausages in pieces of fresh bread, lathered with tomato sauce and if you were lucky, a handful of grilled onions. However this wasn’t unique to my school; sausage sizzles happened all over the country, and while they began as a fundraising initiative (due to the cheap ingredients) they’re now considered a classic Kiwi comfort food enjoyed at family barbecues, food markets and special events up and down the country. Get it at: Often sold at sports events and food markets, and quite often there are sausage sizzle fundraisers outside Bunnings and The Warehouse. Of course, the easiest thing to do is to cook them yourself. NZ sausages, onions, fresh white bread and a bottle of Wattie’s tomato sauce – all available at any NZ supermarket. Hokey pokey is one of the most popular ice cream flavours in the country; a timeless combination of hokey pokey (honeycomb) balls and rich vanilla ice cream. Plus it goes well with everything – cake, waffles, cones, banana splits. It’s the perfect ice cream! And so classically Kiwi. Once you try it, you may find it difficult to eat plain vanilla ever again. 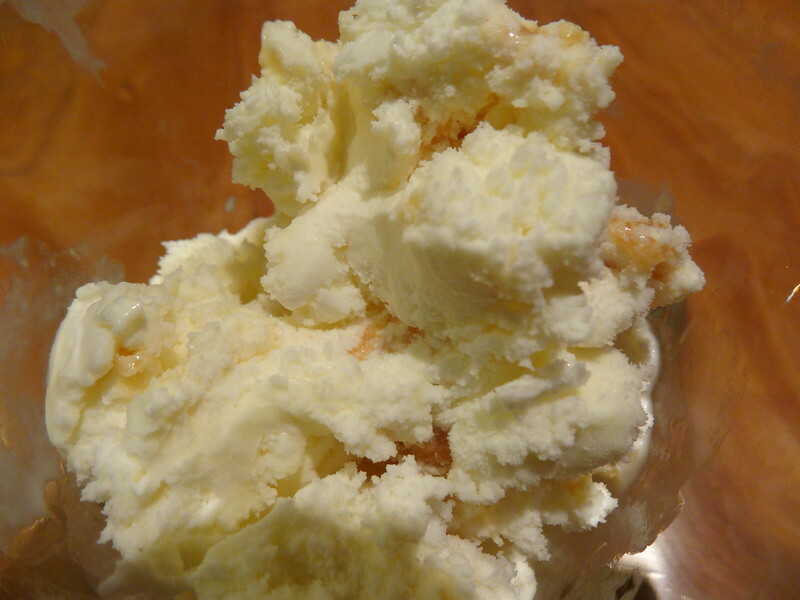 Get it at: This is a Kiwi favourite so any ice cream stand or supermarket will have it. If you’re looking for something special, one of the best hokey pokey ice creams is at Giapo in the Auckland CBD. Giapo does some pretty unique things with gelato and ice cream – just check out their ‘gram! Definitely put them on your bucket list when you get down here. Food in New Zealand often takes influence from British roots – this is one good example. This takeaway treat has become so ingrained in our culture that it would be criminal not to include it here. Every Kiwi will surely have romantic memories of ripping open a steaming hot bundle of greasy goodness; perhaps a crispy battered fillet of Hoki or Tarakihi, a handful of crinkle cut chips and maybe a few other greasy bits from the menu, all wrapped up in yesterday’s newspaper and paired with a bottle of Wattie’s tomato sauce. It doesn’t get much more Kiwi than this! Get it at: Any takeaway joint in the country will serve this, just ask around. My favourite fish and chip shop in Auckland has now closed (nooo!) but if you’re looking for something special, my new favourite is the Fresh Fish Market in Tauranga). You have probably heard tales of the legendary Marmite, which is a standard item in every New Zealand pantry and an absolute must eat in New Zealand. 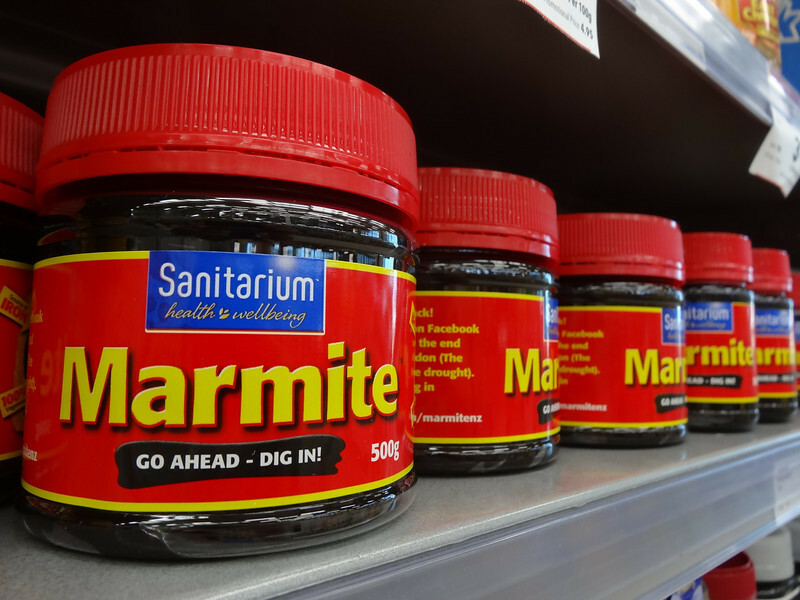 In fact it is so loved that when the Christchurch earthquake damaged the country’s lone Marmite factory in 2012, a national “Marmite shortage” was declared which resulted in a mild panic throughout the nation (call me a traitor, but I actually prefer Australia’s Vegemite anyway). So, what is it exactly? In very simple terms, it’s a yeast extract combined with a few different herbs and spices. The taste itself is really too hard to describe and is something you’ll just have to try yourself, but be warned, it’s a very acquired taste and if you didn’t grow up eating the stuff it probably won’t agree with you right away. Traditionalists would say you need to use Salt and Vinegar chips for this, but I just say go with whatever you want (I like Kettle chips, personally). The recipe is simple enough – white bread, chips and a light spread of butter and Marmite. A common item in every Kiwi kid’s lunchbox. Get it at: Marmite will be found at every NZ supermarket. You should also note NZ Marmite is very different in flavour to the British Marmite. A New Zealand delicacy! Tuatua are an indigenous New Zealand shellfish that you won’t find anywhere else in the world (as far as I know). While very similar in shape and size to pipis, tuatuas have a milder flavour than most shellfish and a softer, creamier texture as well. As New Zealand is an island country the vast amount of shoreline means we are spoiled with shellfish, and the native Maori are said to have enjoyed this one quite a bit back in the day. As I’m told, the tuatua was, and still is, one of the ultimate favourites (definitely one of mine as well!). Get it at: Tuatua can be collected for free during low tide at many sandy beaches around the country (ask a local about the good collection spots). However, the easiest way to get them is simply to buy them at a seafood shop, especially around Auckland where finding them on beaches is becoming increasingly difficult. A dozen will cost you around $8. If you’re cooking them yourself here’s a decent recipe to try. I still remember my first hāngi. I was around 7 years old, and was at school one morning watching a couple of guys dig a massive hole in the middle of our sports field. Later they lowered in some baskets of food, sitting them on top of hot rocks, and then filled the hole in burying our food beneath the ground. 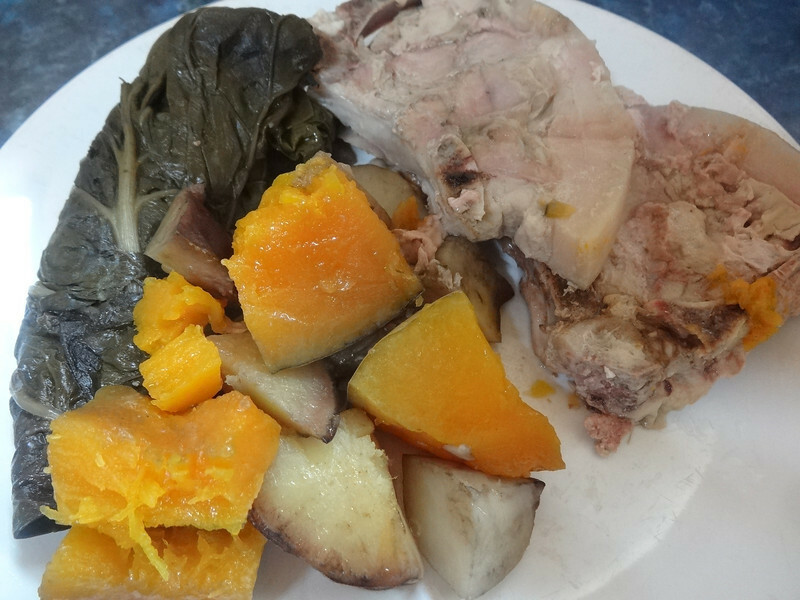 The food slowly cooked over the course of the day, and when lunchtime rolled around I was treated to my first hāngi meal: chicken, pork, potatoes, pumpkin and a few other veges, all cooked beneath the soccer field we used to play on each day. This is a traditional method of Maori cooking that dates back many generations, and is still used today in various Maori communities. If you’re looking to try traditional New Zealand food, this is about as close as it gets. Get it at: For hāngi food actually cooked in the ground, your best bet is to head to Rotorua; a city with a large Maori population and often considered New Zealand’s centre of Maori culture. 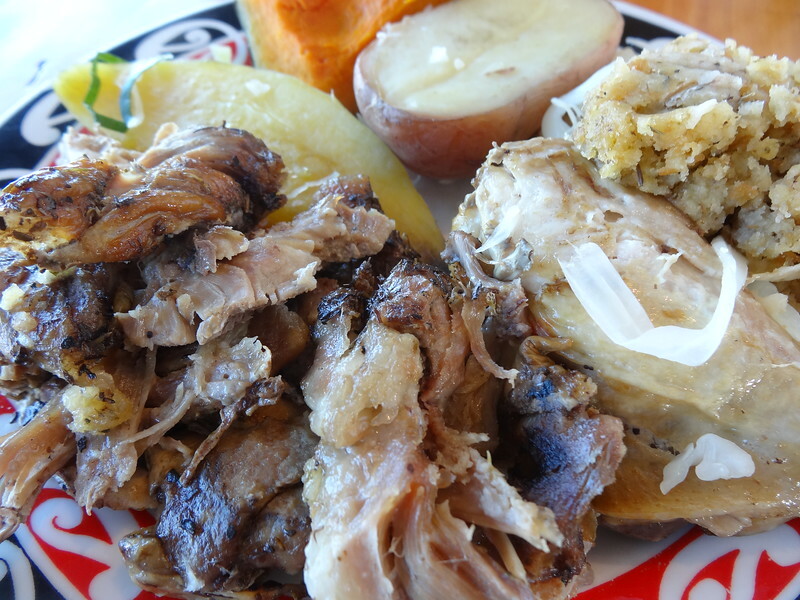 The many Maori village tours will include traditionally cooked hāngi meals in their itinerary. Alternatively you can head to Kiwi Kai, a small kitchen in the city that offers hāngi meals, among other traditional Kiwi food and Maori food. If you’re in Auckland, try The Hāngi Shop. I know absolutely nothing about this dish, other than the fact that Kiwis like it (somehow it has eluded me for the last 28 years). 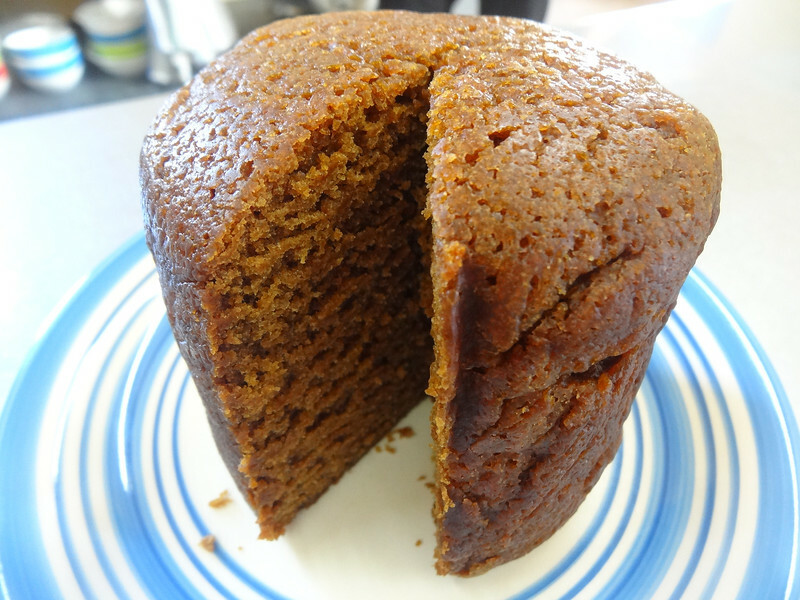 It was described to me as a “Christmas cake without the fruit” and it’s usually drenched in custard, milk, ice cream, or all three at once. Of course I didn’t know this when I tried it, so like an idiot (as you can see in the photo) I just ate it plain like a muffin or a cake. Still tasted fine to me! Get it at: Seems to be popular at the Maori/Pacific Island food stalls at the food markets. You can find microwave puddings at the supermarkets too. Every kid’s birthday party in New Zealand will have three things: potato chips, cheerios and fairy bread. This party treat is made by sprinkling hundreds-and-thousands (you might better know them as ‘sprinkles’ or ‘jimmies’), over a slice of buttered bread and then cutting them into triangles. It’s also worth noting hundreds-and-thousands are not just any type of sprinkle; they refer specifically to the tiny rainbow-coloured spheres (as opposed to the many other shapes and colours available). 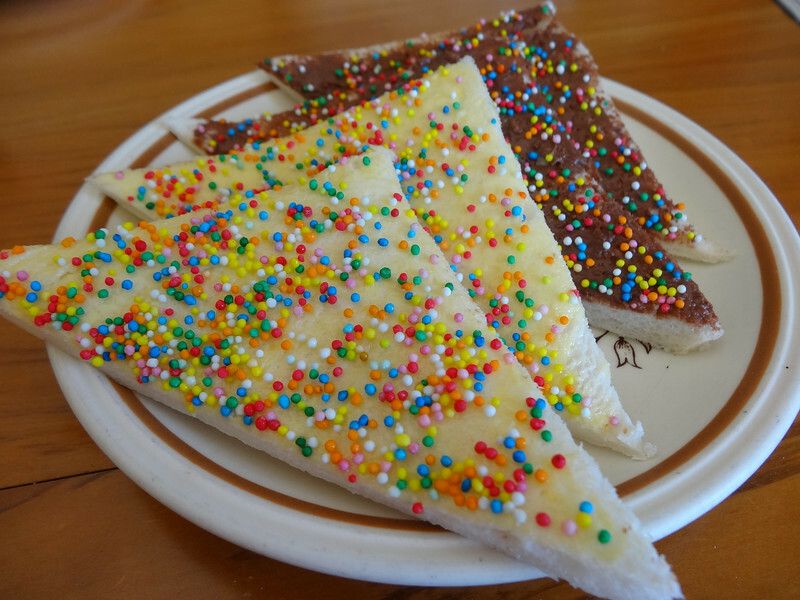 As I’m told, the cool kids now use Nutella instead of butter; somewhat of a fairy bread on steroids. 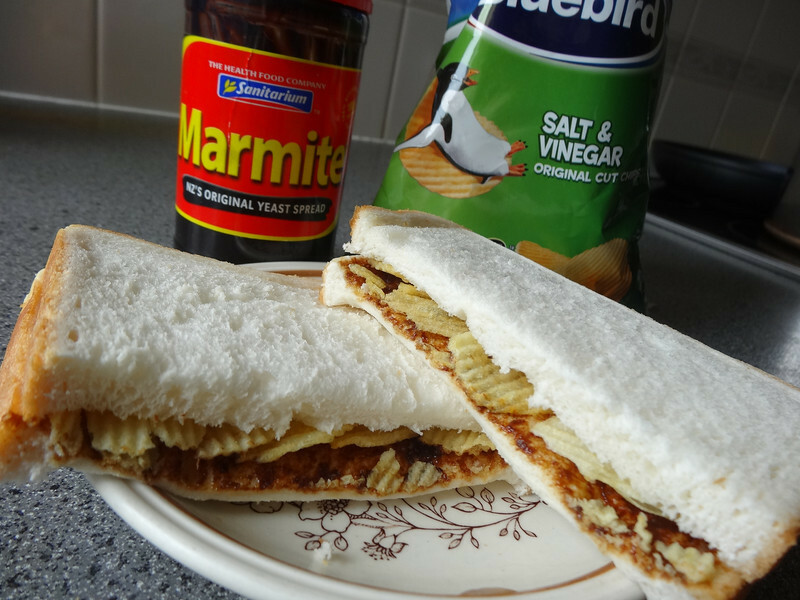 Stuff like this is pretty typical New Zealand food – making something out of nothing in the pantry, like the Marmite chip sandwich above. Delicious though! Get it at: I doubt you’ll find this for sale anywhere, so just pick up the ingredients at a supermarket and make them yourself. Every time I eat a mince and cheese pie it instantly brings back memories of the rainy days at high school, rushing to the tuck shop (school canteen) at lunchtime to warm the senses with a steaming hot pie. And of course, like every Kiwi kid I have memories of hurriedly biting into the pastry and having the scorching mince leave a little burn on my lip as I impatiently gobbled it down. A good, classic mince and cheese will be served hot, filled with mince and gravy, have a generous layer of cheese under the crust and be finished with a nice, flaky pastry on top. Not all pies are created equal, but if you do find a good one it will leave you with a big fat smile on your face, guaranteed. Get it at: Any bakery in the country. 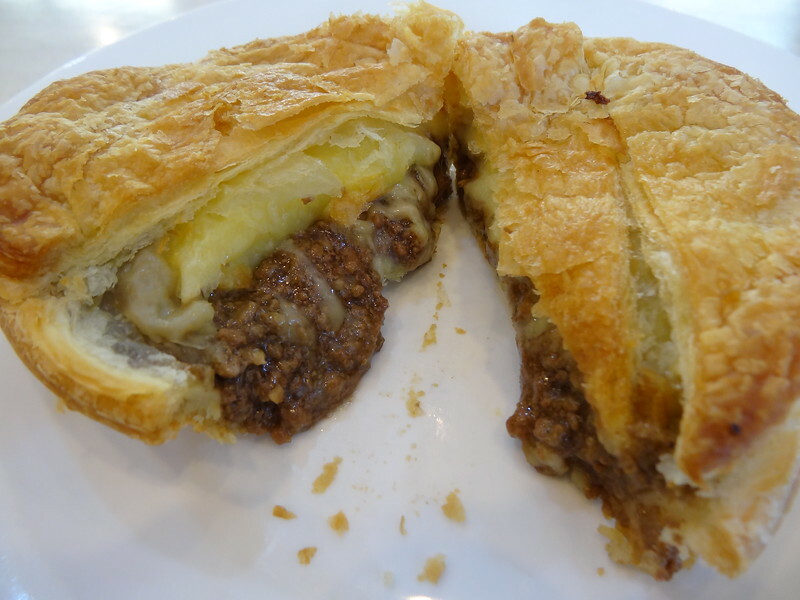 If you want the best, try the mince & cheese from Greenland Bakery & Cafe in Auckland – the current title holder of New Zealand’s #1 pie (in photo). Whitebait is a delicacy in New Zealand and currently demands the highest price of any fish in the country. The preferred method of cooking is the whitebait fritter; a simple combination of eggs, flour and whitebait, fried like an omelette and then topped with lemon, salt and pepper. As you can see from the photo it’s a very tiny fish (as they’re not fully matured) and the the strong fishy flavour can be a little off-putting to some. However a perfectly cooked fritter with just the right amount of crisp will quickly turn you into a loyal fan. Get it at: During whitebait season (Aug – Sept) many cafes and restaurants will have whitebait fritters on the menu. You can also purchase fresh whitebait at seafood stores to cook your own (frozen whitebait is sometimes available in off-season but can be difficult to find). For the enthusiasts, head to the South Island’s west coast, a region famous for it’s incredible fritters. The Original Kiwi Dip is a simple mixture of a Maggi Onion Soup packet and a can of reduced cream (usually a splash of vinegar, too). This dip is so loved throughout the country that both the soup and cream are marketed as official ingredients (as you’ll see in the photo above). Purists would argue that it must be enjoyed with Bluebird chips, another Kiwi favourite, however the dip tends to go well with pretty much anything. Get it at: Both ingredients are cheap and easy to find at supermarkets around the country (both have instructions on the side too). This chocolate covered, fish-shaped strawberry marshmallow is one of New Zealand’s most iconic pieces of confectionery. While obviously not seafood, it’s almost an icon of New Zealand food culture as we are an island and take much of our culinary influence from the ocean. 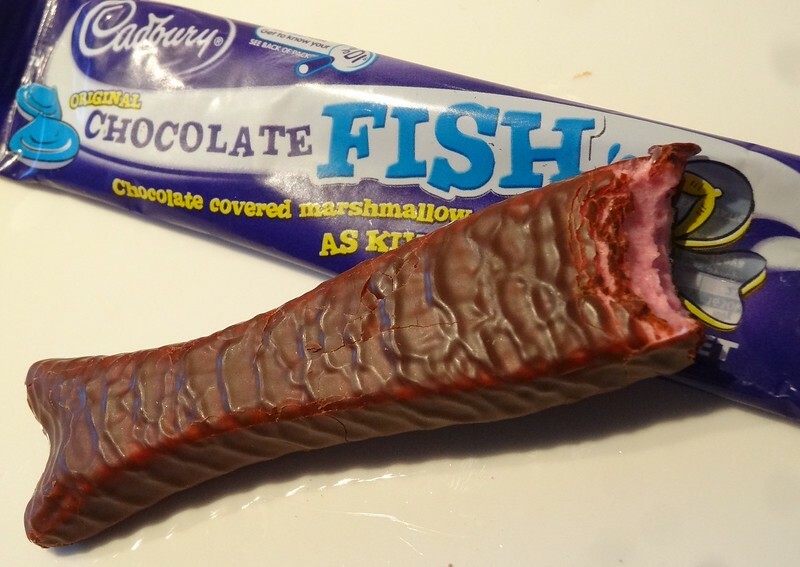 Chocolate fish have always been a favourite Kiwi treat – as a kid you would sometimes get a sticker or a lollipop for being good, but receiving a chocolate fish was always the ultimate prize. Get it at: Any corner store, service station or supermarket. 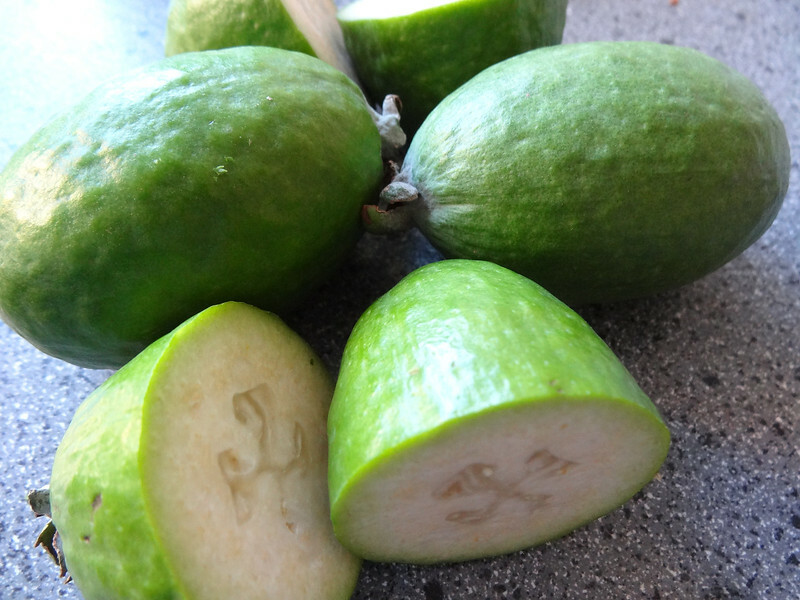 Feijoas are actually native to South America but are commonly grown as a garden plant in New Zealand. Every summer you’ll find feijoas trees fruiting out of control, and it’s common for people to give bags full to their neighbours as a healthy tree produces far too much fruit for one family to consume alone. The taste and smell is extremely unique; somewhat tropical with a texture mildly similar to that of a kiwifruit. Works beautifully in juices and smoothies too. Get it at: The season runs from around March to June each year. Reasonably cheap from any fruit shop or supermarket. Whittaker’s has been serving up chocolate to Kiwis for over a century now and are famous for their creamy, full flavoured milk chocolate. Over the years they’ve developed a wide range of different products, however their greatest creation would certainly have to be the original Whittaker’s Peanut Slab. 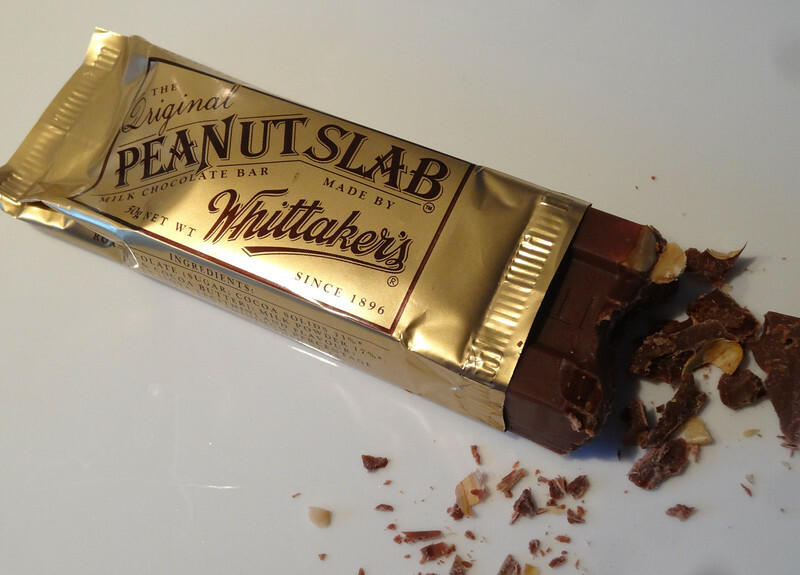 Instantly recognisable from it’s bright gold wrapper and stumpy oblong shape, this block of roasted peanuts and Whittaker’s famous milk chocolate is a true Kiwi icon, and probably the most beloved chocolate bar in the country. Do try it. Get it at: Every supermarket, corner store and gas station will definitely have them. Down at the bottom of New Zealand lies the small town of Bluff, world famous for it’s rich, succulent oysters, which are often considered the best on the planet. If you’re an oyster freak like me you’ll go crazy for these things, however they don’t come cheap or easy; you’ll need to wait until they’re in season (March – August) and they’ll cost you around $25 a dozen. The taste is very different to the regular Pacific oysters; a much more intense, fishy, almost metallic flavour. I prefer them raw with just a dash of lemon, but they also fry beautifully with a light layer of flour and a sprinkle of salt and pepper. Get it at: Any seafood store and some supermarkets, only when in season (March – August). Griffin’s is a New Zealand biscuit company that has created several Kiwi favourites over the years. As a kid my biscuit of choice was always the strawberry filled Shrewsbury, however I would say either Mallowpuffs or Toffee Pops would take the title of New Zealand’s favourite. Their many other creations, such as Gingernuts, Squiggles and Macaroons all have their loyal followings as well. I guess you’ll just have to try them all. Get it at: Any NZ supermarket. 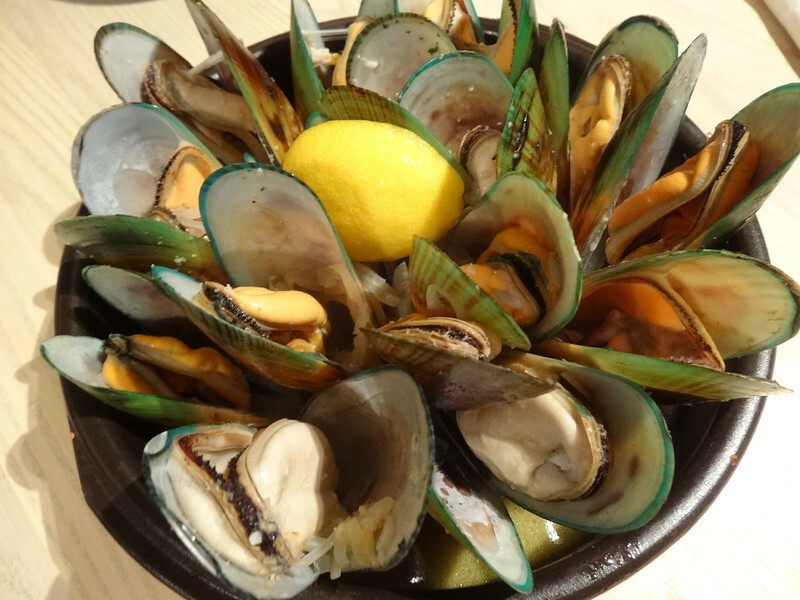 New Zealand green lipped mussels are native to New Zealand and can be found on restaurant menus all around the world. What better place to try them than in the motherland itself? Eating a steaming hot pot of mussels is a definitely one of New Zealand’s great pleasures – pulling apart fat juicy shellfish with mussel sauce dripping all over your hands and face and then wiping the bowl clean with a bowl of fries or a few slices of fresh bread. How can you not love that? Get it at: Cooking your own mussel pot is easy enough, and mussels are reasonably cheap from NZ supermarkets. If you’re in Auckland, the Belgian cafes do a mussel pot special each Monday. However, if you just look around you’ll find mussel pots on quite a few menus around the country. 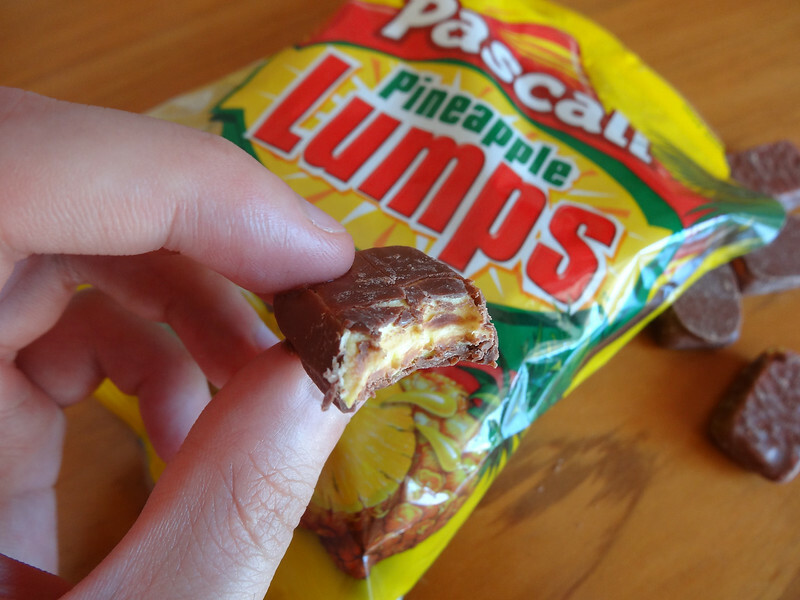 Pineapple Lumps are chocolate coated, pineapple flavoured chews and were invented in the small town of Oamaru back in the 50’s. 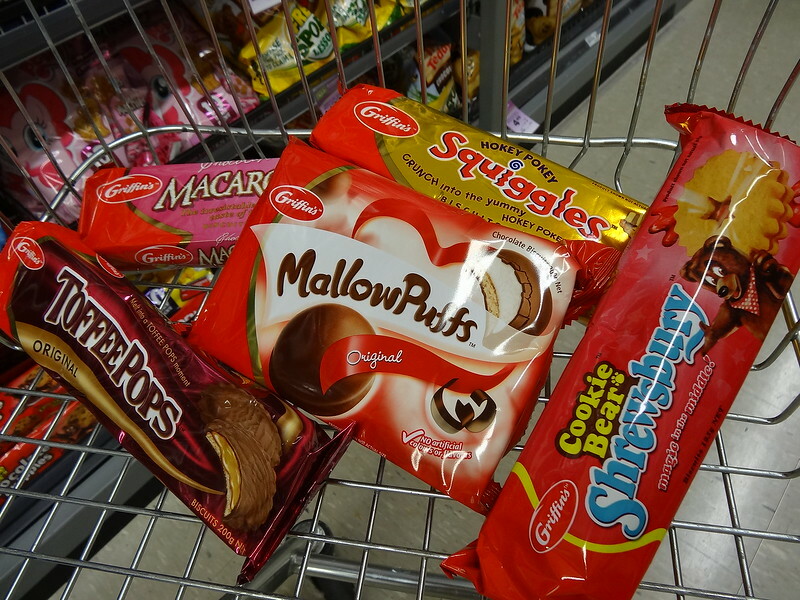 Since then they’ve become one of New Zealand’s favourite confectioneries, and because similar candies are difficult to find elsewhere they are often a popular gift to send to Kiwis expats overseas. Incredibly addictive. Get it at: Any NZ supermarket, corner store or service station. You can also get them on Amazon (for a price). Boil-ups are particularly popular in Maori communities in NZ and are cooked by boiling different ingredients together like a soup, usually with a pork base. Popular ingredients are pumpkin, potatoes, pork and watercress. It’s also common to add Maori style dumplings, known as ‘doughboys’ into the mix. Perfect if you’re craving a bit of hearty, home cooked comfort food. Get it at: More of a home cooked meal, but you can buy yourself a nice little boil-up meal at Kiwi Kai in Rotorua (in photo). The Hangi Shop in Auckland also sells it, although I haven’t tried theirs (yet). Fried bread is another treat very popular within Maori circles, in fact I’d never even heard of it before until I went down to Rotorua looking for it. Whether you partner them with a soup or stew or just lather them with butter and jam, these things will make your stomach very happy indeed. If you’re looking for a soup to try them with, I had mine with a seafood chowder and that was a near perfect combination. 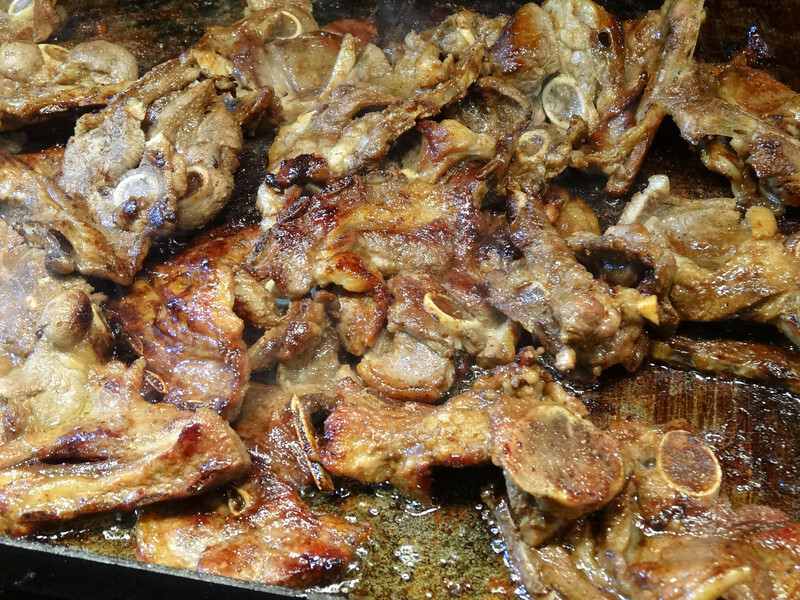 Get it at: Several stalls at Auckland’s night markets sell Pacific Island food. 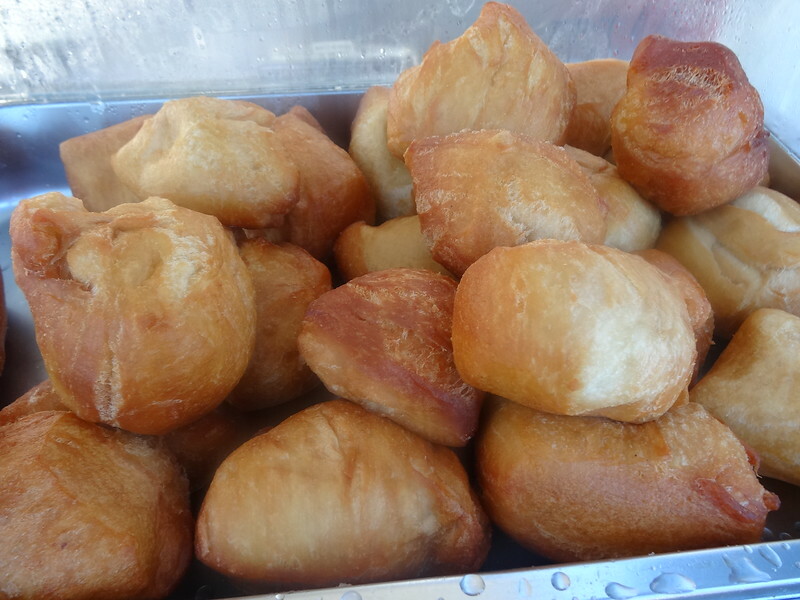 The fried bread in the photo is from Kiwi Kai’s stall at Rotorua’s Saturday morning market. 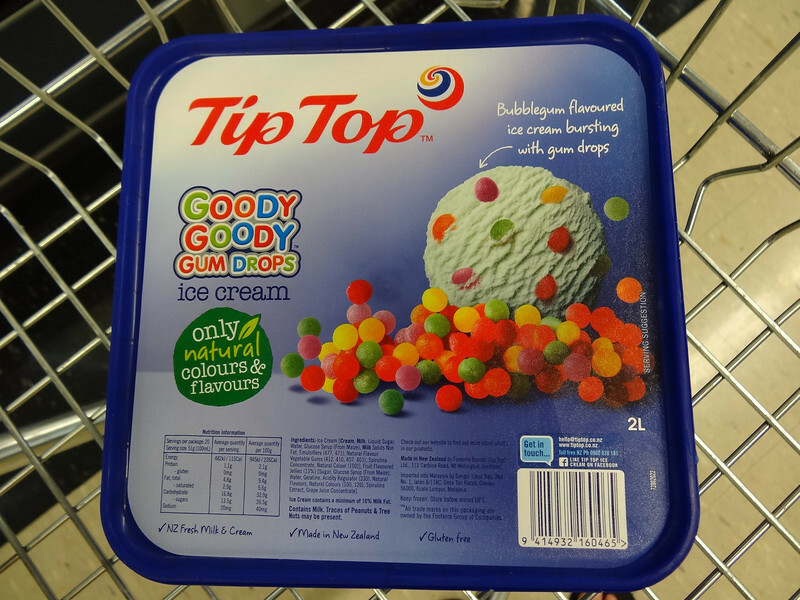 Goody Goody Gum Drops is a NZ ice cream flavour, consisting of classic bubblegum flavoured ice cream mixed with small, gummy fruit lollies. It’s one of the iconic New Zealand desserts and will be sold everywhere. Every kid used to have a different way of eating it; some would spit the lollies out and eat them all at the end, some would spend most of the time sucking on the gumdrops from each mouthful and others would just gulp the whole thing down. Whatever your style, this flavour definitely makes dessert time a little bit more fun. While tripping around the country putting this post together I stumbled upon this popular Maori bread, something I’d never heard of before. As the story goes, the Maori cooked up the receipe for rewena after the British introduced them to flour, and since then it has become a favourite among the Maori community in NZ. The bread is made with flour and potato, and follows a recipe similar to that of a sourdough. A nice, subtle difference to your regular loaf of white. 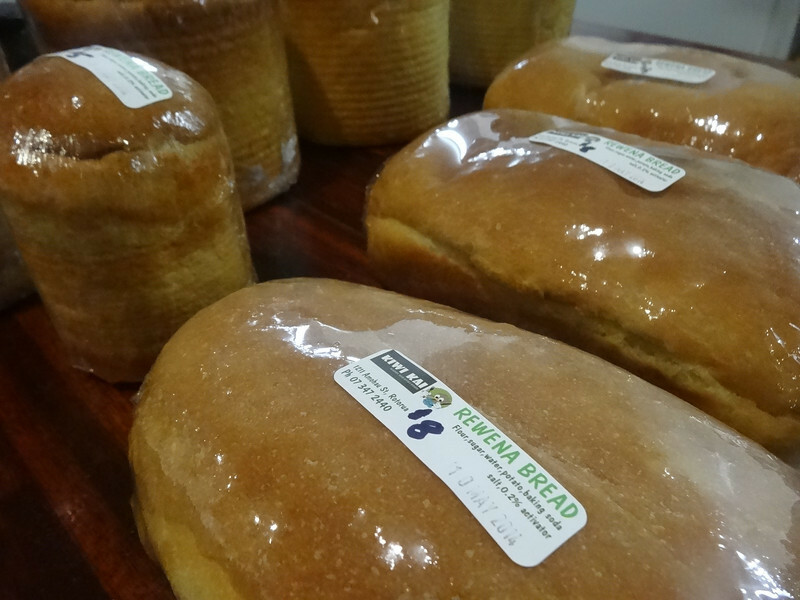 Get it at: The bread in the photo is from Kiwi Kai in Rotorua (they also serve a great rewena burger). You’ll also find this at various food markets in Auckland. The Italians would probably cringe at the sight of this – New Zealand’s hilarious attempt at merging two of their flagship foods. It would be sad if it wasn’t so delicious. Wattie’s spaghetti in tomato sauce is exactly what it sounds like – a can of spaghetti in tomato sauce. Kiwis grow up on this stuff, and one of the favourite ways to eat it is to turn it into a wannabe pizza: more commonly known as spaghetti on toast. Take a piece of toast, cover it with spaghetti, sprinkle it with cheese and then zap it under the grill. Seriously, I bet even the All Blacks eat this stuff. Get it at: All ingredients found at any NZ supermarket. Due to the name people often associate this fruit with New Zealand, even though it’s native to China and produced mostly by Italy. 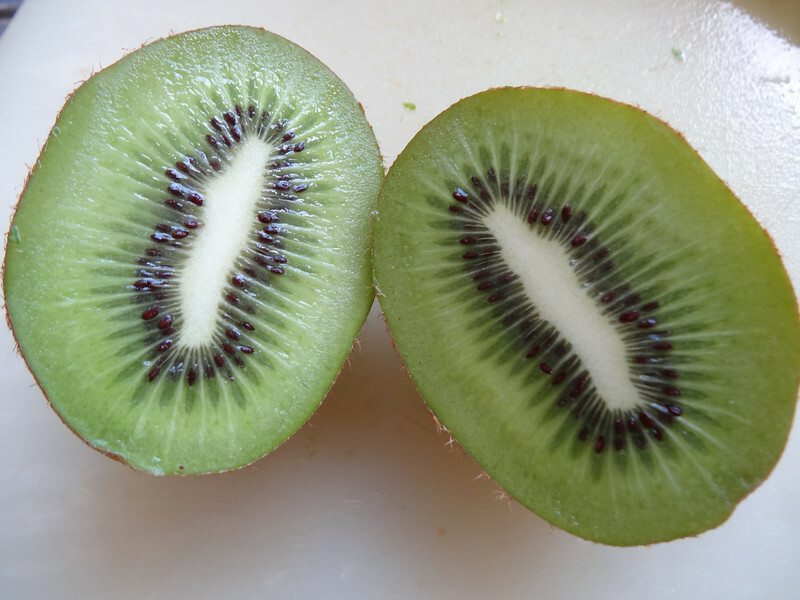 However you will find a lot of Kiwifruit down here in New Zealand and it’s cheap, too. Try the yellow/golden version for a milder, sweeter flavour. Get it at: Any supermarket or fruit shop. Yes, it’s true – we have a lot of sheep, and we eat a lot of them too. While lamb is enjoyed all over the world, you won’t find them much cheaper or fresher than you will down in New Zealand. Every eatery will have their own offerings of lamb chops, lamb steaks, lamb racks and lamb burgers, and you owe it to yourself to try all of them while you’re on our shores. While the name might suggest a Middle Eastern origin, make no mistake – this cookie is 100% a Kiwi food original. A classic recipe afghan consists of a chocolate cookie baked with cornflakes mixed in, coated with chocolate icing and then finished off with half a walnut on top. It has quite a unique texture as it’s both crunchy and smooth, and despite all the chocolate it’s not actually as sweet as you might expect. 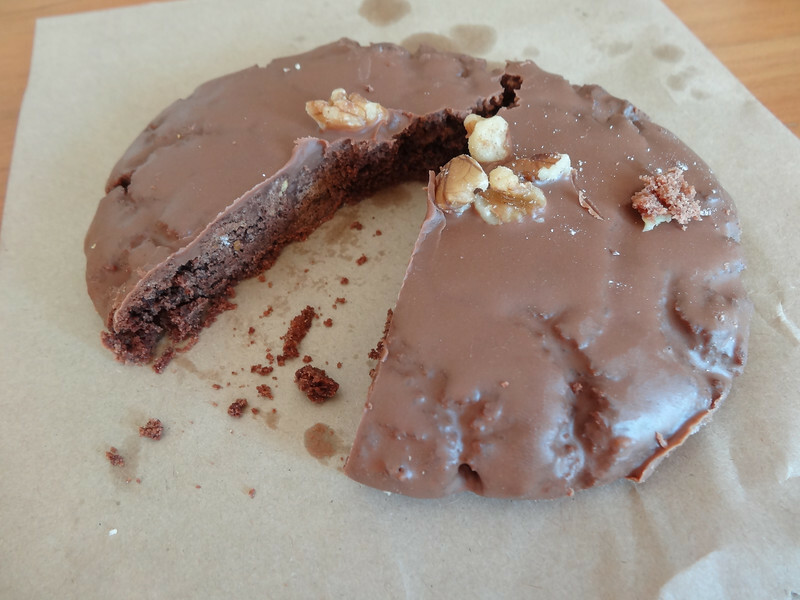 Looking at the picture it might seem like just a regular chocolate cookie, but most Kiwis will easily be able to tell an afghan from the very first bite. Get it at: Every bakery in the country should sell them. If you can’t find them there, Griffin’s makes quite a decent afghan and you can buy a pack of these at any NZ supermarket. 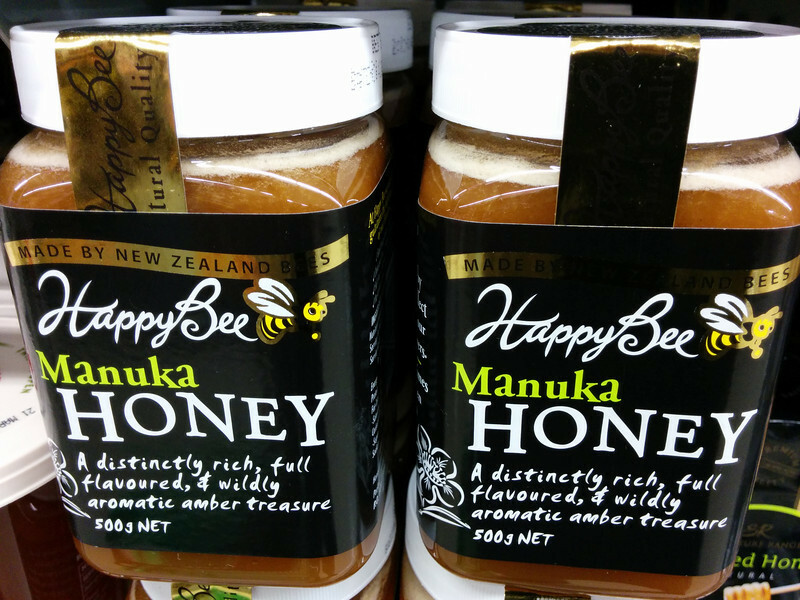 Manuka honey is a New Zealand (and Aussie) produced honey, made with pollen from the manuka tree that grows throughout New Zealand. Apparently it does all sorts of magic things for your health, none of which I can vouch for. It has a much richer, heavier flavour than regular honey (quite a distinct smell too) and I’ve noticed that people love receiving this as a gift, probably because it’s so expensive outside NZ. If you’re looking for an edible souvenir for mama, this could be the one. ANZAC stands for Australian and New Zealand Army Corps, representative of our troops who fought during World War 1. The story that I know goes like this: wives and mothers used to send biscuits to their sons and husbands during the war, careful to use ingredients such as oats and golden syrup that wouldn’t spoil during the journey. 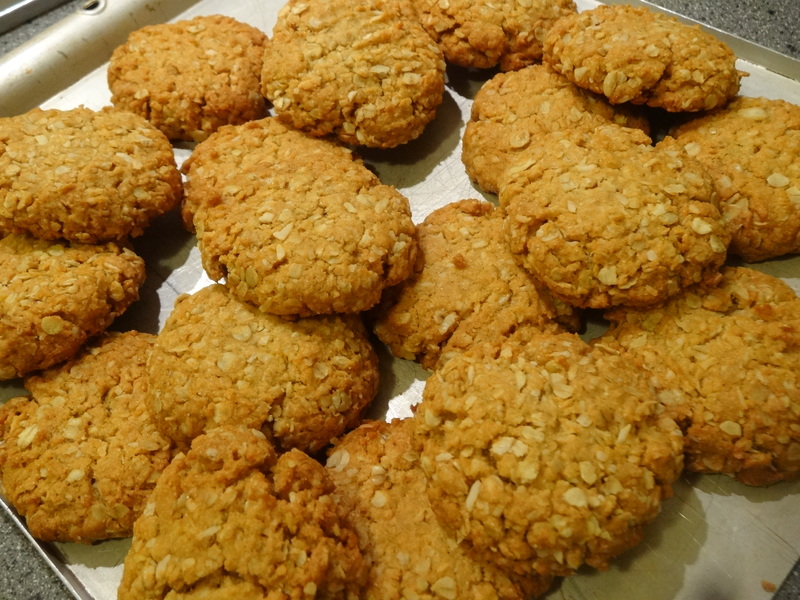 After the war the biscuits were aptly named Anzac biscuits, and have been known as such ever since. Over the years the recipe has changed quite a bit, from a hard flat biscuit to a softer, chewier one, and these are still extremely popular throughout the country today. Get them at: Can be found at supermarkets, some bakeries, and are also sold for fundraising on Anzac Day (April 25). If you’d like to try baking them yourself, give this recipe a go. It’s not hard! L&P is a drink that originated in the small New Zealand town of Paeroa. I don’t have the full story; all I know is there was something special about the mineral water there which eventually led to it being bottled and sold. Later it was mixed with lemon, and the drink Lemon & Paeroa was born. 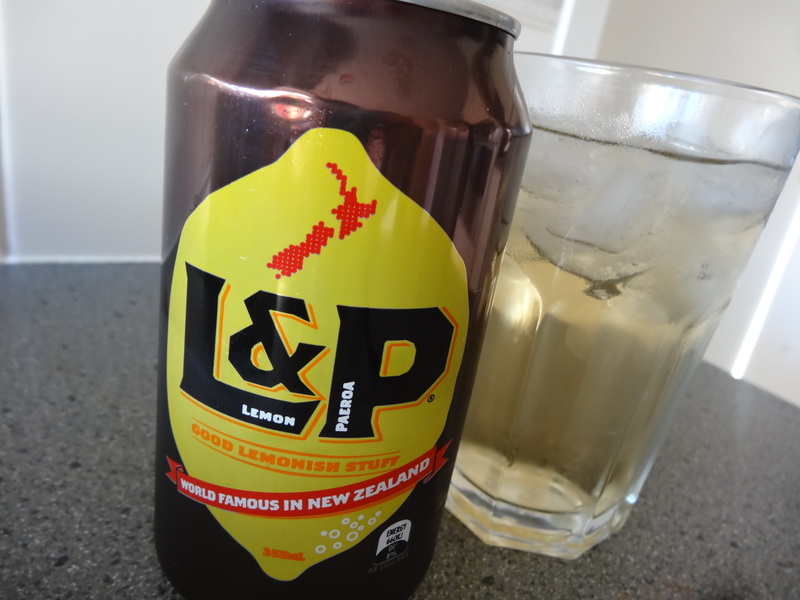 L&P is hugely iconic in New Zealand, similar to what Inca Kola is to Peru, and if the country were ever to officially name a national drink I’ve no doubt this would be the one. Make sure you try it! Get it at: Anywhere with a drinks fridge. Pavlova is a New Zealand dessert best described as a big meringue cake topped with fresh fruit and cream. The inside is soft, like a marshmallow, and together with the crispy outside provides quite a special collision of different flavours and textures. Very sweet, so if you’re a dessert lover this will definitely rate highly on your list. A Kiwi icon! Get it at: Quite hard to find actually. You can buy undecorated ones from supermarkets but they’re not the greatest. If you have an oven handy, have a go at baking one yourself – it’s actually quite simple. A thank you to my Mum who baked the one in the photo especially for this post! Well, there it is; my answer to what people eat in New Zealand. What do you think? Have you been to New Zealand? Which of these did you try? If you’re a Kiwi, what did I miss? Let me know in the comments below! For affordable accommodation in New Zealand, I recommend using Airbnb. This will allow you to get both private rooms and fully furnished apartments at rates far less than hotels and some hostels, especially in the bigger cities. You can get $25 of free Airbnb credit using this link. I highly recommend purchasing travel insurance, particularly if you plan on partaking in the outdoors or road tripping up and down the country. For a beginner’s guide to travel insurance, why you need it, and how to get it, check out my post Travel Insurance 101: Everything You Need To Know. You can save a lot of money booking your activities using Book Me. There are activities throughout the country, such as surfing, diving and day tours, and all of them have substantial discounts. Hey Bren, great article and cool to see you exploring food right at home. That Hāngi looks fantastic! I’ll probably be in Bangkok soon-ish, let’s arrange that meetup! Nooooooo!!!!!!! Don’t ever use sour cream! 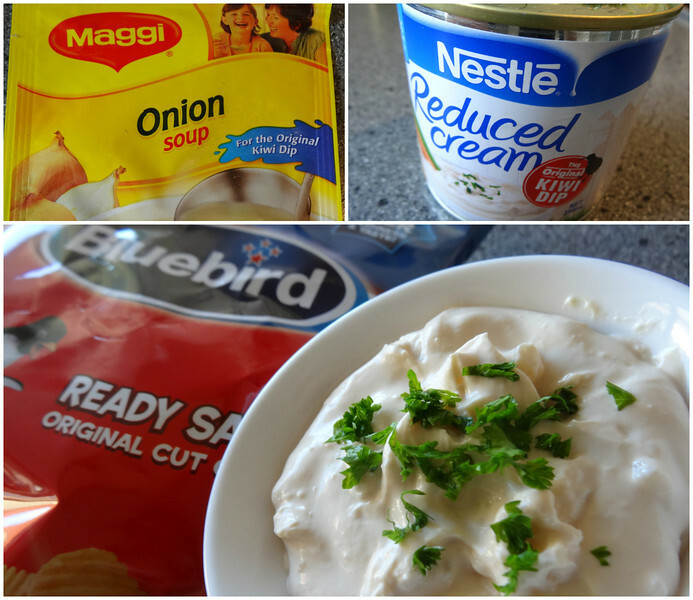 Kiwi Dip is not Kiwi Dip unless it’s made with reduced cream and Maggi onion soup!!!! Cheese rolls, first I’ve heard of that. Will seek them out next time I’m down that way! I need to try these cheese rolls you speak of.. They are AMAZING. The best cheese rolls in NZ are in Athol, there’s two cafes right next to each other and it’s the one closest to Queenstown. They are next level! Hey Brendan; really appreciate you adding some of our products on your blogs. Your photography is great, you’re angles are great – you’ve been able to enhance these products with excellent photography! Well done! Hi Mark, Kiwi Paella, sounds good! I could actually imagine eating that, the tuatua would go quite well with rice I think. Hi yes I’ve also enjoyed my fair share of roasts too 🙂 Wasn’t sure if it was unique enough to NZ to include here but still a goodie! Just looking at this list makes me very hungry. It’s so nice to see that every country has something unique to show us. I would really like to eat the fish and chips, but that only because I like chips very much. All the foods look and I think taste great! 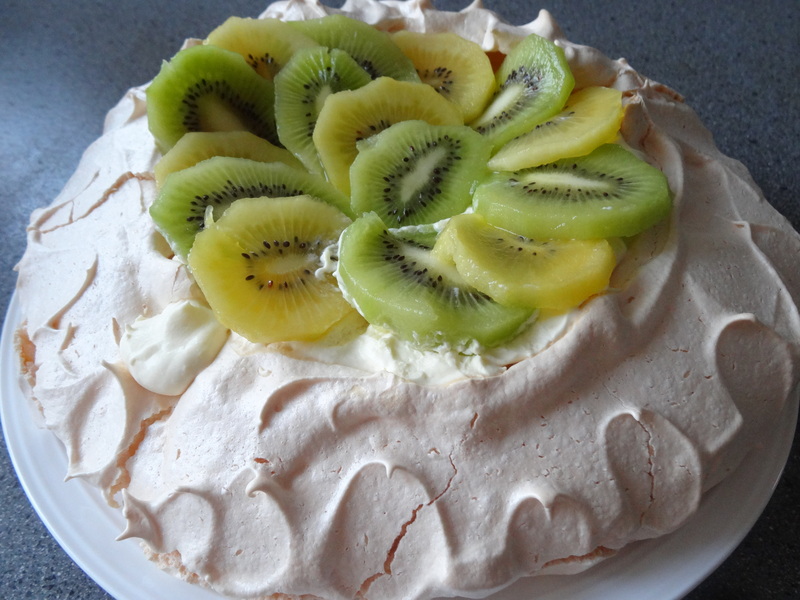 All the stuff i desperatly miss out on in germany 🙁 my attempt of making pavlova turns out better everytime i try, but making the kiwi dip….jeees it was a horrible desaster! Anyone here who wants to send me a box full of goodies? 😀 need to go back to nz soon!! Hah, what went wrong with the Kiwi dip? I’m guessing you had to use a different kind of soup and it wasn’t a great substitute. http://www.sanza.co.uk would probably ship to Germany. Obviously as everything is exported from NZ, it’s more expensive but still easy to get carried away. OK, buzz bars I totally forgot about. Haven’t had one of them in years! When I was in high school the Tuck Shop had Buzz Bars on ice. They go more chewy when they are cold. They’re all very yummie indeed. Gotta love those jet planes, although I am more of a wine gums guy myself. Omg Lolly Cake for sure!!! Plus Cheese Rolls are perfect for Incercargill lunches! Invercargill I mean. Oops. But yes also Jet Planes and Wine Gum lollies!! Why are Tim Tams not on this list?! Tim Tam slams are the best! Hi Rob, officially, Tim Tam’s are Australian, so they’ll be included in my Aussie Food Frenzy, if I ever do one. Lolly cake/log should definitely make the list, and the Eskimos can actually be substituted for pineapple lumps which TASTES AMAZING! Cheese rolls are definitely a go, apparently you can now buy them deep fried too? Yet to try that though. When I was growing up in Ch-Ch (way back when!) I used to LOVE Stevies (Stevensons) square mince pies. Does anyone remember them? I loved peeling off the puffy top layer of pastry from the pie to reveal a more gooey layer just above the mince filling. That bit was SO yummy! Those pies were ALWAYS screaming hot and used to burn my lips and mouth! Love your photos, by the way – they advertise Godzone’s food in a most fantastic and nostalgic way! I didn’t include Vogel’s because I recalled reading somewhere that it was actually a Britsh invention. But yes, still a favourite down in NZ. I can never get it to toast perfectly, though. Ooooh yes that one’s a goodie, missed it! I lived in New Zealand for a year and have only been back in Canada for about 4 months. I came across this article and just had to see what was on your list. I would absolutely DIE for some pineapple lumps and some feijoas right about now 🙂 Thanks for posting, it brought back some great memories! Haha – everyone falls in love with Pineapple Lumps. Must be one of our greatest inventions. I just sat here and read through this with my husband (from New Zealand). A lot of these brought back memories for the both of us! Definitely going to pass on the marmite, fairy toast, and spaghetti sandwich though. Strange. Thanks so much for sharing! Great list! going to new zealand’s south island in early sept and look forward to trying some of the treats you described. will try to let you know how i liked them. #34 Eat a tomato RAW. Dunno if anyone already does this, but I used to do it as a kid in NZ. They were so, so sweet and delicious. I tried to do the same when I came to Australia but nope, just doesn’t quite work the same way. I’m looking forward to those goddamned feijoas when I head back BUT THEY WON’T BE IN SEASON. Disappointment++ Used to have a whole bag to myself. Thanks for making me realise the spaghetti on toast was a kiwi thing haha, I had no idea… thought it was just a thing mom did. Funny that it only works with Wattie’s though; other brands are crap. Also haven’t had chips in bread in forever…damn…. that looks good. Need some Ripples or Bluebird chips for that – don’t have that here either. And of course, the fish’n chips. 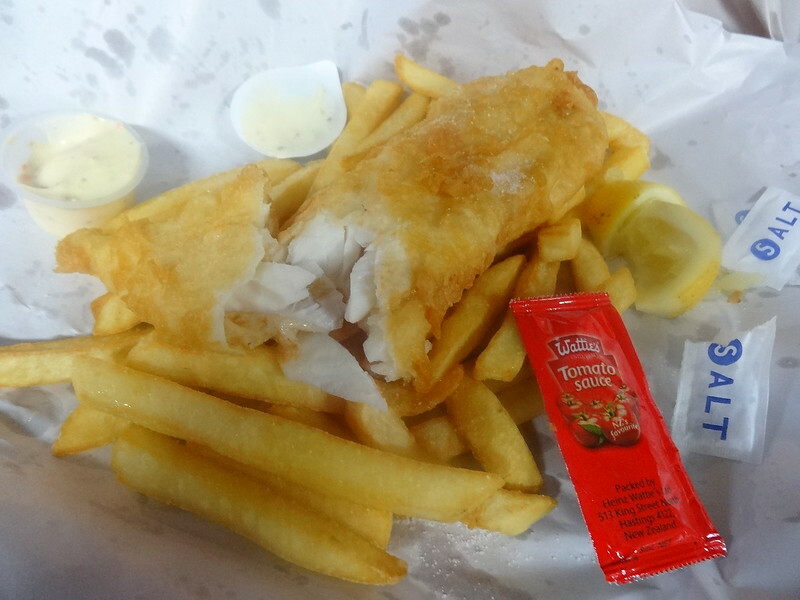 Salivating for some kiwi fish’n chips, who woulda thought it’d be so different? Ripples don’t exist anymore. Whoever made that business decision needs to punch themself. Kiwifruit are a NZ thing – Chinese gooseberries are from China, but we took them, developed our own cultivar and so called them Kiwifruit. And then stupidly sold them to Italy (smh). 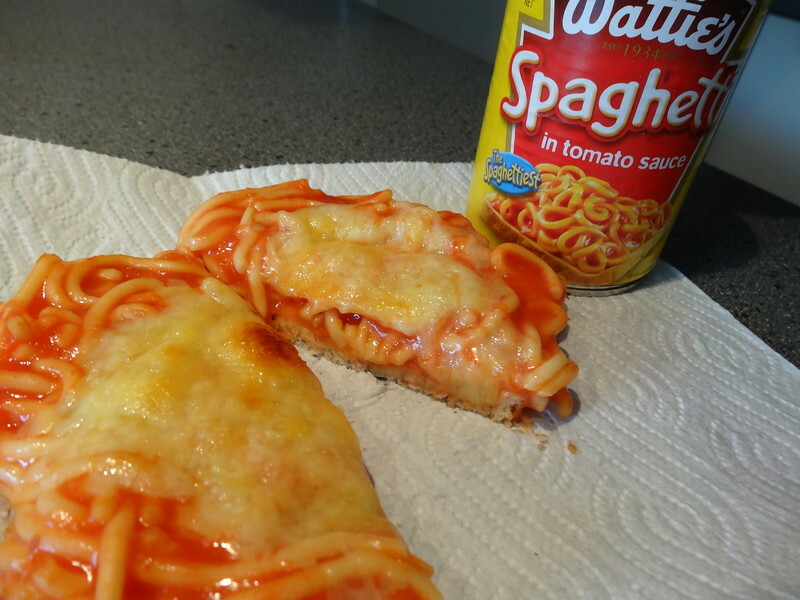 When I was a kid, “pizza” was a scone dough base, spread with onion, then tinned spaghetti, then cheese, then bacon. Just as yummy hot or cold for school lunch the next day! What a fabulous list! Makes me homesick. Toffee Milk, milk biscuits, snifters, Jaffas, hotdogs on a stick (they call them kiwi dogs here in Aus) rashuns, ginger slice! Now I’m really homesick. Haha! I think creamed paua should be on that list as a dipping sauce with fried bread! lol everything looks sooo good! fully missing home now! awesome article! ? Jaffas and milk bottles – man I destroyed my fair share of bags of those when I wad a kid..
Great list ! Mussel fritters too and Kina either straight from the shell or on toast or rewena bread with real butter mm mm !!! Oh and vogels !!! What are the ingredients and how do you make cheese rolls? 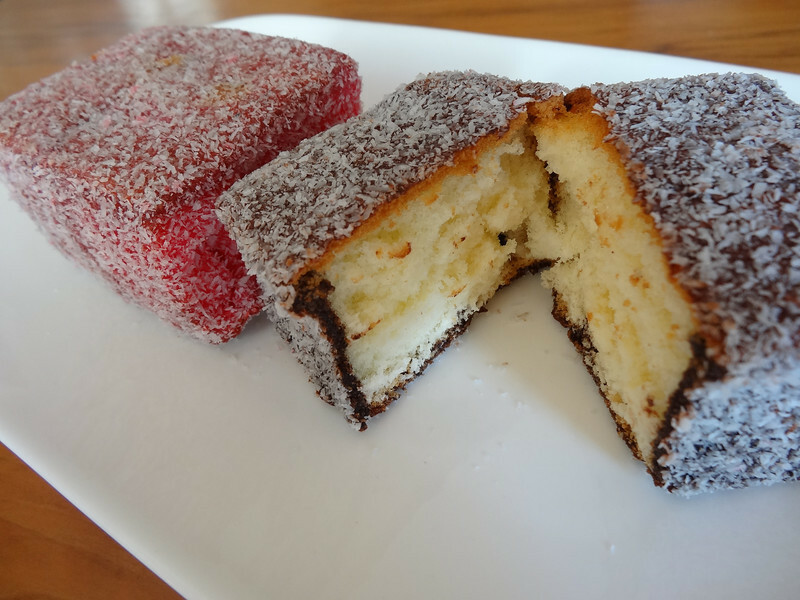 lamington’s are australian – I’d remove those from the list and add the cheese rolls as above! the guardian article was an april fool’s joke. I agree don’t forget Crayfish and must have snapper for the fish and chips that’s to die for. I know this is off the subject, sorry but you people seem to have NZ figured out. We are planning a trip to NZ. No tours for us. We like fishing too. What is a good itinerary? Wow you spent a lot of time eating the sweeter things but missed Custard squares how about Weetbix Milo and a standard when I grew up was the Lamb roast remember NZ built its economy on exports of primary produce from the farms Lamb, Beef ,milk products Wool etc.. Left overs were called Bubble and Squeak. and all those handy meat pies sold in all dairys and service stations from mince to bacon and egg just loved them. Weetbix and Milo both originated in Australia. I tried my best to keep the list to Kiwi origins. Great post, mate! I just moved to Invercargill from New Mexico, USA, and the food is quite different. Since different is what I was looking for, that’s a good thing! I’ve only been here a day, but I’ve already tried Whitaker’s milk chocolate with Hokey Pokey, L&P, chocolate fish, and some blue cod fish & chips. All excellent! I think I’ll be on a mission to find some cheese rolls today. My family had all read about them before we moved, and we’re all keen to try them out. Checked out your post on Kiwi slang, too. Should be heaps helpful. Keep up the good work. Hey Erik, welcome to NZ! You’re down near Bluff so you’ll need to try those oysters when the season comes around. And we’re heading into whitebait season now so you’ll need to get some o that! 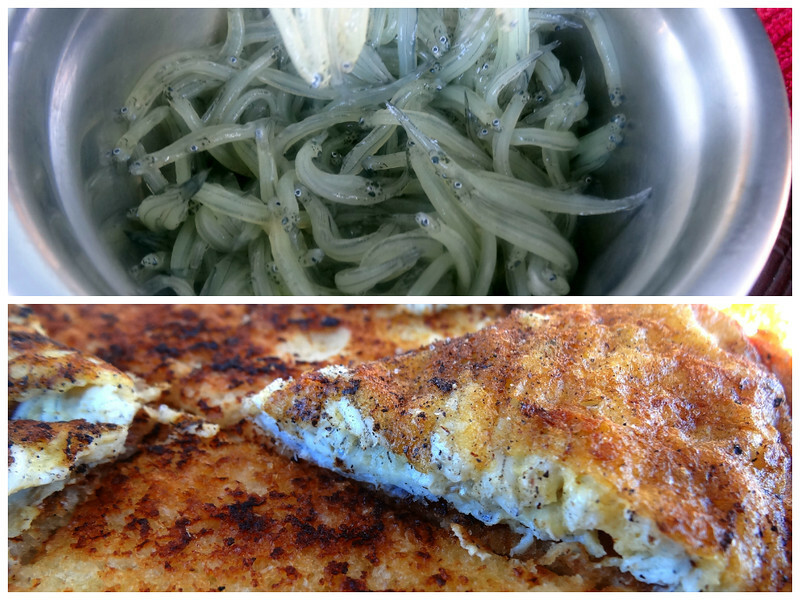 I saw a cart selling whitebait fritters, but wasn’t able to stop. I’ll keep an eye out for them, and be sure to give them a try. I have added several more of the items mentioned here to my list so far – Cookie Time, Afghans, Marmite (used VERY sparingly), Peanut Slab, and Pineapple Lumps. All were also excellent. The only thing on your list that I’ve tried that I haven’t liked is spaghetti on toast. It was just too sweet of a sauce, even for my kids. But I could see that if it was something you grew up on, you might view it differently. I’ve also had a couple of cheese rolls since I’ve been here, and they’re the bomb. You really should try one when you can. Very simple and unpretentious, but delicious. It’s a good thing the running here is great, I’m going to need to do a lot of it to work all this Kiwi food off. Awesome! Mate just hope you don’t get addicted to those mince and cheese pies because then all the running in the world won’t help you. I don’t drink coffee so I guess the flat white escaped me. I can eat the crap out of a bag of feijoas though! Are asparagus rolls (Eketahuna Sushi) uniquely kiwi? I have no idea. We do eat them a lot though. Never had them anywhere else. Was happily surprised and hooked when I first tasted those at a school function! What about tamarillos? I’m a kiwi living in England at the moment and i constantly drive my co workers insane with my nz food cravings , i showed them this blog post and they want to try all of them! drool pineapple lumps , what about some whittakers choc ? I included the Peanut Slab! Love your list! 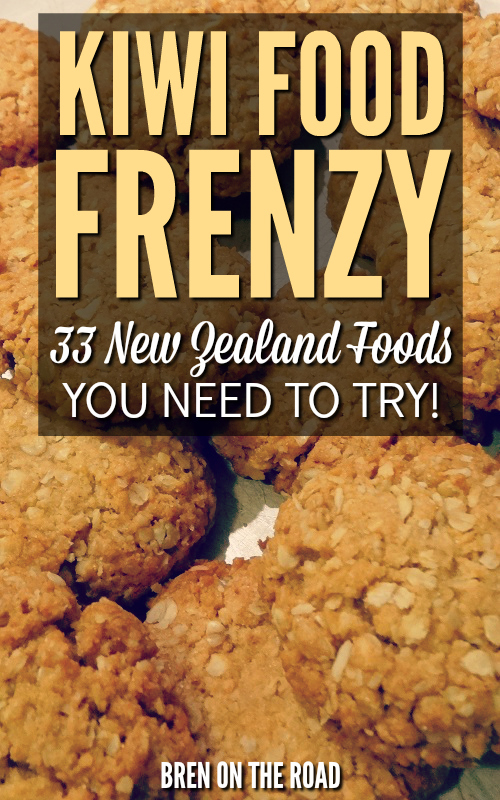 The Anzac biscuits are a must! Dip them in your coffee or tea! Yummy! Roselands Restaurant in Waitomo Caves serves these delicious cookies on their dessert buffet along with cornflake cookies, peanut brownies and another Kiwi favourite, Carrot Cake w/cream cheese icing. Their website also has the cookie and cake recipes for you to try. Something missing on your list is the salad dressing made from the recipe on the can of -Can’t remember brand- Condensed milk. Condensed milk, vinegar, mustard and salt (Read the can for the quantities, I can’t remember them and they don’t have it on the can in the UK.). Delicious. Yes home made salad dressing made with Hylander condensed milk. I reckon a lot of the kiwi favourites would be in the Edmonds Cookbook. Every family had one of those and my mum used it all the time. Ginger Crunch is an original from that cookbook. I really miss fresh cream donuts, feijoas and the huge hokey pokey ice creams from Pokeno. Yummy!!? Great blog! Was wondering about the donuts with cream? The classic round donut with cream and jam is a NZ speciality. A far superior donut to any where else in the world. The filled roll with the condensed milk dressing was also a favourite! The fish and chips are also the best in the world. On my last trip back to NZ I ate donuts and fish and chips ever day . . . ? I’m not 100% sure those are Kiwi inventions, but yes, I ate those all the time too when I was a kid. Good memories. Feijoas are the best! Used to eat bags and bags of them. I want to go to New Zealand so much, the people sound wonderful and the food sounds amazing. i went to NZ south island last year..I only managed to eat the NZ mussel, fresh salmon at lake tekapo and milk of course..
i really regret that I didnt try Cookie Time biscuit/ drinks! its a must next time! 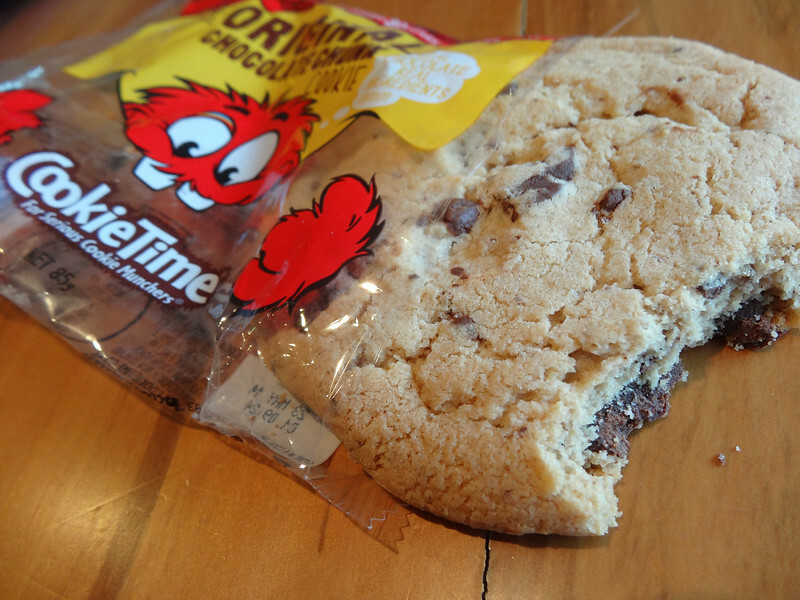 Cookie Time is legendary – seriously. Aloha 🙂 What a fantastic article. Thanks so much. And everyone’s comments…. ohhh… homesick now. LOL. Hi Bren, this article is what I am really looking for through varying of things in the internet. I’d love to send a massive tons of thanks to you for introducing those your childhood and favourite and typical food in town. 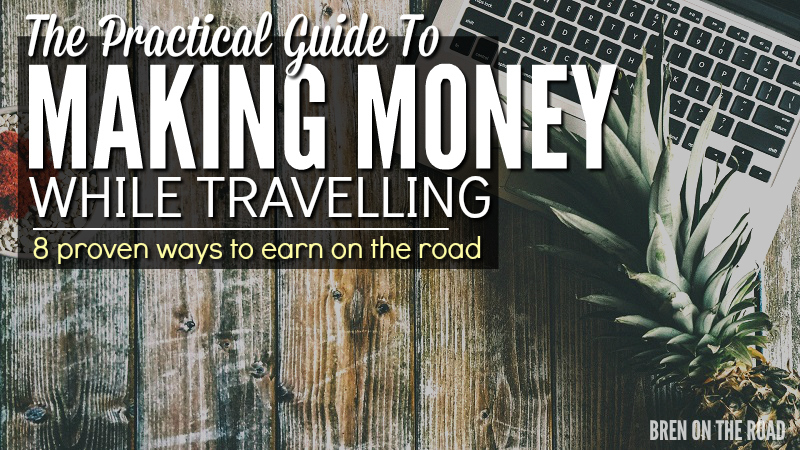 It’s very helpful for international travellers like me to get to know more about . With the contributing from kiwi netizens, it’s more than amazing. Again, thanks Bren and kiwi netizens. Bren, how could you make this list and leave out custard squares? Shame on you. Just been reading the variety of likes of people. Great isn’t it. Paua fritters are supposed to be green. What I’d give for some hokey pokey and a paua fritter. 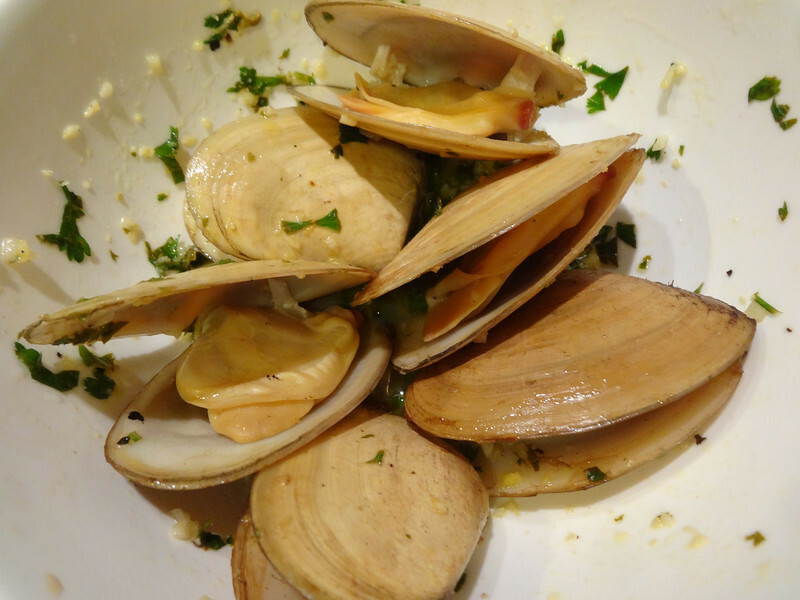 Mussels and pipis or tuatua – great. Presume your’e still not allowed to get toheroas. Great memories. Hard to find these things in the Land of Haggis. Local bakery does Anzac biscuits. Hey what about watties creamed corn? I missed it so much when I was living in the UK. I would dream of creamed corn and cheese toasting pies (or jaffles if your Australian) or creamed corn and cheese on toast – you do the same as the spaghetti & cheese on toast that’s heated under the grill. Being from Dunedin I also will vouch for how yummy cheese rolls are. Also are brandy snaps filled with cream a NZ thing, they are definitely a kiwi Christmas staple in our house. I can demolish some cheese and corn toasties in winter. Holy moly…. Going to NZ in march this year. What is just one signature dish you have. For example Australia has the meat pie. My son and I will be in NZ for his birthday mid June. This list has given me life. I am so ready to try EVERYTHING. thanks for creating this list. It’s a a perfect helpful guide. You’re welcome! Wish him happy bday for me. Wonderful posts! .. Enjoy cooking love to eat expect to tour NZ September – November 2017. bon appetit !! Been to New Zealand just the once and didn’t try any of these (except the British-eque stuff) ???? Going to use this Blog for an ESL/EFL class, thanks for the food for thought! p.s. Why are Afghans called Afghans…and Lamingtons called Lammingtons? Fried bread should always be eaten with golden syrup! just saying .. lashings of better and golden syrup! The only things I can think of are Orange Choc Chip Ice cream, bacon & egg pie, and roast pumpkin. The Brits don’t seem to have grasped the idea of roasting pumpkin. I have such good memories with Goody Goody Gum Drops ice cream. I tried to find it throughout my time in new zealand! I would actually count how many gum drops I’d get in every bowl! That being said, I missed out a few things like Bluff Oysters. Damn they look tasty! looks like I’ll have to visit again. I still hanker after aniseed wheels which I bought from the local dairy in North East Valley in Dunedin in the 60’s with the money I made from collecting returnable glass soft-drink bottles from around the neighbourhood. Are they still available? I am a kiwi living in USA. I miss tamarillos, passionfruit, smoked snapper and digestive biscuits. I haven’t been to New Zealand but all this stuff is sounds so amazing. I have read another blog of yours on Kiwi slang and you’ve inspired me. I love the way of life in New Zealand. It’s so chilled and laid back aye. Hope to visit there one day and hope to try all these amazing dishes. You’re welcome down here any time!